Your appetite will benefit others. You can get free pancakes all day Tuesday at IHOP. And all those calories are for a good cause. Call them hotcakes, flapjacks, griddlecakes or silverdollars, just don't call them late for breakfast. In case you haven't heard, today is Pancake Day! Until 10 p.m., you can head to participating IHOPs nationwide to help yourself to a free shortstack of pancakes. In fact, it's better than a free meal, because the entire day is an effort to raise awareness and money for the Children's Miracle Network Hospitals. All you have to do is make a small donation while you enjoy your complimentary breakfast. Donations made in Connecticut will benefit programs at Connecticut Children's Medical Center, but you can click here to check out all the Children's Miracle Networks across the country. This year, IHOP is hoping to stack up a record $2.3 million. So what's the story of Pancake Day? It all apparently goes back hundreds of years. The tradition started when the English would prepare to fast during Lent. Strict rules prohibited eating dairy products during Lent, so people made pancakes to use up all their eggs, milk and butter, thus creating Pancake Tuesday or Shrove Tuesday. Pancake Day is usually celebrated on Fat Tuesday, but this year IHOP got the flapjack fiesta started a week early. 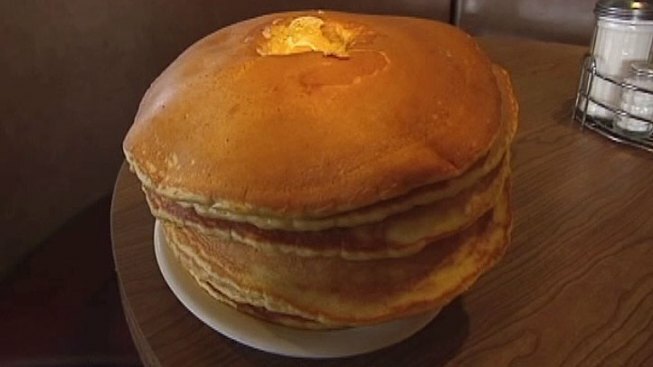 Here's another fun fact, if you made an uber-stack of all the pancakes IHOP made during last year's Pancake Day, you'd have a 31.5 miles of pancakes. Now that's a lot of syrup.